Reading, Writing, Drinking. Behold the glory that is Speakeasy. If you’re kicking around Adelaide on the evening of September 21st, drop by the Wheatsheaf Hotel. 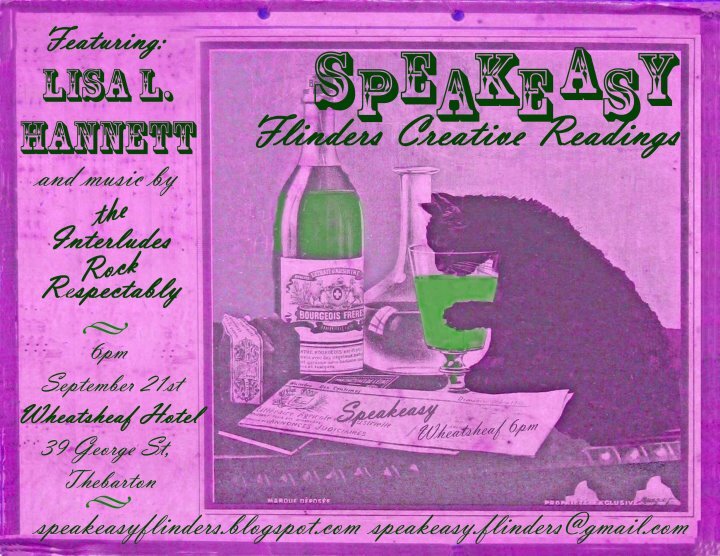 I’m honoured to be headlining the Speakeasy Creative Readings event — I’ll be reading from Bluegrass Symphony and possibly enjoying a nice glass of red. Come one, come all! It’s going to be a great night. Tags: bluegrass symphony, creative readings, speakeasy, wheatsheaf, words and booze. Bookmark the permalink. Previous post ← O frabjous day! Callooh! Callay!